Perfect to use as a soy sauce dipping bowl for sushi, this small cherry blossom bowl is great to pair up with the rest of the sky blue series with the Sky Blue Cherry Blossom Medium Bowl, and Sky Blue Cherry Blossom Large Bowl. With an overall light blue color, this cherry blossom bowl has several hand painted red and blue cherry blossoms decorating the exterior portion of the bowl. Although the inside of the bowl with lid is a simply white color, the classic blue and white colors of this bowl with lidwill easily match with other tableware pieces as well. 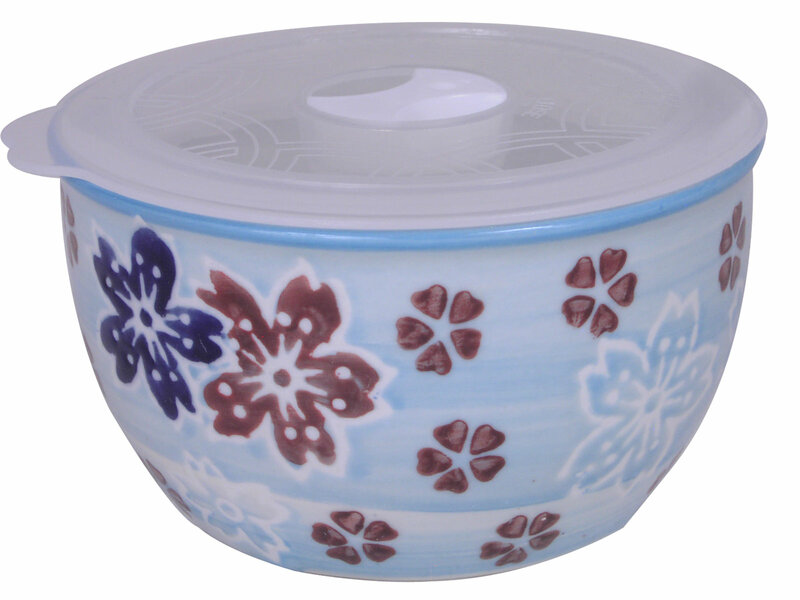 With a smooth and glossy texture, this cherry blossom bowl is microwave and dishwasher safe for your convenience. While great for dipping sushi in soy sauce, this dipping bowl is also great for other dipping sauces like ketchup, ranch and much more. Feel free to use for healthy treats like baby carrots as well as the plastic lid has an open and close switch for easy steaming as well. Packaged in a paper box.